Our seed variety—Hale’s Best—is a 1923 Heirloom and is one of the best known, sweetest, and most productive of cantaloupe varieties. While watermelon is considered by many to be the top quintessential summer fruit, it needs to move over and make room for cantaloupe. Sweet, juicy cantaloupe is similarly hydrating and serves as a welcome cooling snack on hot days. Cantaloupe is a delicious accompaniment and addition to a number of dishes and makes an excellent addition to smoothies and homemade salsas. Cantaloupe—Cucumis melo—is an annual fruit (considered a kind of berry) and a member of the Cucurbitaceae family. This huge flowering plant family includes gourds, squashes, pumpkins, and cucumbers, in addition to melons. Cantaloupes are actually a type of muskmelon, which also includes honeydew, and Crenshaw among others. They are called rockmelons in Australia, presumably due to their resemblance to…well, rocks. Muskmelons originated in Persia and were widely cultivated by ancient Egyptians, Greeks, Romans, and, later, by the Europeans. It is thought that cantaloupe was a favorite among the Italians who named it after a former papal seat in the 1700’s. Christopher Columbus introduced cantaloupe to the new world on his second voyage in 1493, where it was enthusiastically welcomed by natives of the caribbean islands where he landed. It became a commercial crop in the U.S. sometime around 1890. Water regularly taking care to avoid wetting the foliage—using a soaker hose is best. pH – 6.0-6.5. Soil temperature must be 75 – 95° F or seeds will not germinate! The warmer the better; cantaloupes cannot tolerate frost. In the northern part of the country, sow seeds indoors around 4 weeks before the last frost. Plant seeds ½” deep and take special care of roots when transplanting outside. Plant seedlings 24” apart. Consider using black plastic sheeting to warm soil. 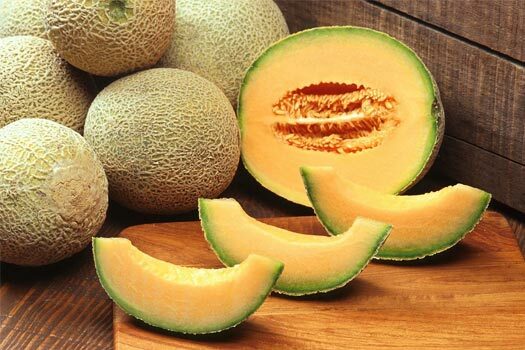 Cantaloupe takes around 85-120 days to grow from seed to ripe fruit. Cantaloupe plants are heavy feeders. Apply a thick layer of organic mulch (compost is ideal) as the vines start to creep. Keep a close eye out for common pests, such as squash bugs, squash vine borers, cucumber beetles, and aphids, which can be a problem. Healthy, well-tended plants may be able to fend off pests; otherwise, consider using row covers, taking care to allow access by pollinators. During growth, it’s not unusual for some melons to start to grow and die well before harvest. Yes. Use a big pot (at least 5 gallon) and a strong support (like a trellis) that will allow you to train the vines to grow vertically. You can tell when the fruit is ready to harvest when the rind has turned from green to tan, and the melon comes off the vine easily (test by applying gentle pressure). Or, if you have a good nose, try giving it a sniff. If it smells sweet and ripe, it should be ready. Succulent, homegrown cantaloupe is in a different stratosphere of deliciousness compared to the supermarket version. If you love cantaloupe, grow your own—it’s worth the effort. Cantaloupe grows on vines which can trail up to five feet in the garden, unless you train them to grow vertically on a support. These are heat-loving, slow-growing plants. They need a long growing season of 16 weeks or so. Higher temperatures mean a shorter growing time. Cantaloupe is a good source of fiber, packed with vitamin C and other vital antioxidants.